The case studies featured on this site provide examples of a range of issues related to the management and regulation of whale watching. While it is easy to recognize the need for regulation, it is often challenging to know how to introduce regulations where none have existed before, or how to change management strategies if the industry outgrows the measures already in place. Those responsible for managing whale watching in areas where whale watching has developed quickly may be wondering how to “put the genie back in the bottle”. A number of researchers who have studied management strategies promote an adaptive management model – one that is reviewed and adjusted on a regular basis in relation to observed pressure on the target whale or dolphin populations1-4. This monitoring and review may require collaboration with researchers who can design reliable studies to measure the (potential) impact of whale watching activities on the target populations and help determine the limits of acceptable change (LAC) or other measures that can be used to indicate whether current measures are effective or need to be adjusted to prevent negative change2,3. There is no one-size-fits-all management strategy that will work for every whale watching industry. A modelling study conducted by Pirotta and Lusseau in 20155 showed that different management strategies and tools – either used singly or in combination could be effective in allowing at least some wildlife tourism businesses to thrive and the focal wildlife population to survive (even if in lower numbers). However, in the model, a complete absence of management resulted in the extirpation of the target population of wildlife, and as a consequence, a collapse of the tourism industry that depended on it5. Dolphin watching boat with bowriding bottlenose dolphin. Photo courtesy of Fabian Ritter. Voluntary Codes of Conduct: Voluntary codes of conduct are often drafted by Industry representatives, tour operator associations, or NGOs with an interest in conserving whale and dolphin populations targeted by whale watching activities6. These usually focus on approach guidelines and the conduct of vessels and their passengers around whales and dolphins. They may be the most common form of management employed around the world, and often comprise an important precursor to more formalized regulation embedded in local or national legal frameworks. Voluntary codes of conduct can be effective where all stakeholders are aware of the codes and are invested in abiding by them and helping to enforce them7. However, experience and research has shown that competition between tour operators and a perceived pressure to get tourists close to whales often drives operators to contravene the codes, leading to a potential breakdown of the self-regulating system and unsustainable levels of disturbance to the target animals6,8-10. Where studies have been conducted, most researchers recommend more formal regulations that can be monitored and enforced through legal sanctions for infractions8-10. Examples of the strengths and weaknesses of voluntary codes of conduct are discussed in the case studies on Port Phillip Bay in Australia and Scotland. High quality whale watching labelling schemes: Labelling or certificate schemes are often an extension of voluntary codes of conduct that allow operators who adhere to a defined set of standards to receive a recognized ecolabel that sets them apart from other operators, hopefully giving them a marketing advantage over operators that do not strive toward this standard. Schemes can be administrated by local, national or regional governments, NGOs or a coalition of stakeholders. One example is the WhaleSense scheme in effect on the East and West coasts of the United States, as well as Hawaii (jointly run by NOAA and Whale and Dolphin Conservation and described in more detail in the case study on the Gulf of Maine). 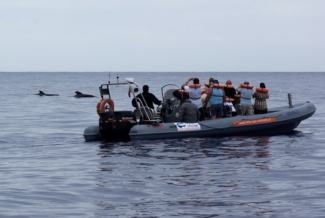 Another example is the ACCOBAMS High Quality Whale Watching (HQWW) certificate, which requires participating operators to undergo an ACCOBAMS approved training course before receiving the label. To be effective, these schemes require a great deal of education and awareness-raising so that tourists understand the value of this label and what it aims to achieve. Legally enforced whale watching regulations: Legally enforced whale watching regulations are formalized in local (national park, municipal, state or provincial) or national laws. They can include any of the components below, but are differentiated from voluntary codes by the fact that a government body will have the authority to monitor and enforce compliance. These regulations usually specify the sanctions that will be issued if operators do not comply. The Tonga case study illustrates how voluntary codes of conduct can evolve to become embedded in national law, while the Dominican Republic case study illustrates how enforcement and issuing of sanctions can be conducted through multi-stakeholder collaboration. Sanctions can include fines, enforced days in port (e.g. temporary suspension of tours) or revoking of permits for repeat offenders. These legal measures are only effective, however, if they are supported by mechanisms to raise operator and tourist awareness of the regulations, and to monitor and enforce compliance4,11. 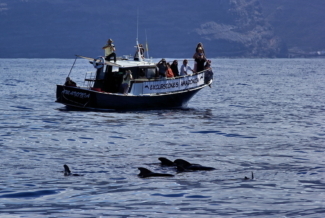 Whale watching vessel in La Gomera, Canary Islands. Photo courtesy of Fabian Ritter. Whale watchers in the Antarctic with humpback whale. Photo courtesy of Chris Parsons. Approach guidelines: This is one of the most common forms of regulation, and is a component of almost every set of guidelines and regulations issued throughout the world. Approach guidelines usually include minimum distances that vessels must maintain from whales and dolphins, as well as approach angles and speeds. They are most effectively portrayed with diagrams, such as these reproduced from the Colombian guidelines for marine mammal watching (see right). Approach guidelines can be tailored to different species (as in the Colombian example), different age classes of animals (e.g. calves) and different situations (e.g. approaches by motorized vessel, helicopter, plane or paddle boat/kayak, as well as in-water interactions). They can form part of a voluntary code of conduct (see above), or be formalized in legally enforceable regulations adopted at the local (e.g. national park, municipal, state or provincial), national, or regional level. Approach guidelines may include speed limits in high density whale areas, as a proven method to reduce the likelihood of collisions and/or lethal injuries if a collision occurs12. 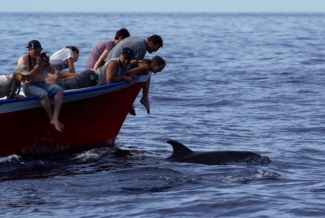 Permitting or licensing of whale watch tour operators: This strategy is used in many places, including Tonga, Samadai Reef, Egypt, and the Dominican Republic. Regulators can use research that has determined the carrying capacity of their site or seek expert advice to determine the maximum number of tours that should be allowed to operate on a daily basis. A pre-determined number of permits can then be issued to operators, and can specify the number of vessels or individual tours that each operator may operate/offer on any given day. Some managers have switched from permitting operators to permitting individual vessels, to ensure that operators do not run multiple vessels and tours simultaneously on the same permit. The issuing of permits can be tied to operator compliance with various conditions, e.g. vessel safety, the use of trained naturalist guides to ensure an educational component to tours and respect for approach guidelines. The number of permits that are issued on an annual basis can be regularly reviewed and adjusted in relation to observed levels of impact or disturbance to the target whale or dolphin populations. Zoning and Time/Area closures: Important whale or dolphin habitats, such as those used for resting or nursing, can be declared off limits permanently or at certain times of the day or year to eliminate or limit disturbance to animals during critical times in their life cycles4. This may be particularly effective for populations that are resident year-round and show high site fidelity, or for areas where migratory populations have specific feeding or nursing areas to which they return each year. Their site fidelity and predictable use of important habitats makes them easy to target for whale watching, but also makes them particularly vulnerable to disturbance during activity that is essential to their long-term well-being13-15. Time area closures are proving an effective way to ensure that spinner dolphins that use the Samadai Reef in Egypt have a delineated area where no humans may disturb their rest and an adjacent area where human interactions are allowed only at certain times of day. Some experts recommend the concept of ‘one-third space and time rules’, in which one-third of each day and one-third of the area is reserved for animals to be left alone, to protect natural behaviour patterns16. The creation of a Marine Protected Area (MPA) or Cetacean Sanctuary: Where specific areas are proven to be important habitats for whales or dolphins, the creation of a cetacean sanctuary can facilitate the design and enforcement of specific whale watching management measures in that area, even if it is not feasible to introduce these management measures at a wider (e.g. national) scale17,18. Park or sanctuary managers and/or local/state government or other management bodies can set limits for the number of operators allowed to offer tours in the MPA, limit hours during which tours can be conducted, and enforce approach guidelines. Perhaps most importantly, the creation of an MPA can also justify the collection of park/sanctuary entrance fees from tourists engaging in whale and dolphin watching activities within the MPA. These fees can be used to cover the costs of managing whale watching – including the administration related to issuing permits and licenses as well as monitoring and enforcement. The creation of an MPA has played an important role in successful management of whale watching in the Chubut Peninsula, Argentina, Loreto Bay, Mexico and Samadai Reef , Egypt. Different categories of MPAs or cetacean sanctuaries and the considerations involved in creating and managing them are reviewed in various sources, including a volume dedicated to marine protected areas for whales and dolphins by Erich Hoyt18. Dolphin watching boat in Madeira, Portugal. Photo courtesy of Fabian Ritter. 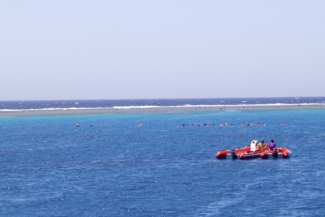 In the Samadai Reef, Egypt, a small MPA has been created where specific zoning regulations and codes of conduct can be strictly enforced in order to protect resting spinner dolphins. Photo courtesy of Amina Cesario/HEPCA. Higham, J., Bejder, L. & Williams, R. Whale-watching: Sustainable tourism and ecological management. (Cambridge University Press, 2014). Higham, J. E. S., Bejder, L. & Lusseau, D. An integrated and adaptive management model to address the long-term sustainability of tourist interactions with cetaceans. Environmental Conservation 35, 294-302, doi:10.1017/S0376892908005249 (2009). Lundquist, D. in Whale-watching: Sustainable Tourism and Ecological Management (eds J. E. S. Higham, L. Beijder, & R. Williams) Ch. 23, 337-351 (Cambridge University Press, 2014). Tyne, J., Loneragan, N. & Bejder, L. in Whale-watching: Sustainable Tourism and Ecological Management (eds J. E. S. Higham, L. Beijder, & R. Williams) Ch. 17, 242-260 (Cambridge University Press, 2014). Pirotta, E. & Lusseau, D. Managing the wildlife tourism commons. Ecological Applications 25, 729-741, doi:10.1890/14-0986.1 (2015). Garrod, B. & Fennell, D. A. An analysis of whale watching codes of conduct. Annals of Tourism Research 31, 334-352, doi:https://doi.org/10.1016/j.anna... (2004). Parsons, E. C. M. & Woods-Ballard, A. Acceptance of Voluntary Whalewatching Codes of Conduct in West Scotland: The Effectiveness of Governmental Versus Industry-led Guidelines. Current issues in Tourism 6, 172-182 (2003). Wiley, D. N., Moller, J. C., Pace, R. M. & Carlson, C. Effectiveness of Voluntary Conservation Agreements: Case Study of Endangered Whales and Commercial Whale Watching. Conservation Biology 22, 450-457, doi:10.1111/j.1523-1739.2008.00897.x (2008). Allen, S., Smith, H., Waples, K. & Harcourt, R. The voluntary code of conduct for dolphin watching in Port Stephens, Australia: is self-regulation an effective management tool? Journal of Cetacean Research and Management 9, 159-166 (2007). Duprey, N. M. T., Weir, J. S. & Würsig, B. Effectiveness of a voluntary code of conduct in reducing vessel traffic around dolphins. Ocean and Coastal Management 51, 632–637 (2008). Scarpaci, C., Dayanthi, N. & Corkeron, P. Compliance with Regulations by “Swim-with-Dolphins” Operations in Port Phillip Bay, Victoria, Australia. Environmental Management 31, 0342-0347, doi:10.1007/s00267-002-2799-z (2003). Currie, J., Stack, S., Easterly, S., Kaufman, G. & Martinez, E. Modeling whale-vessel encounters: the role of speed in mitigating collisions with humpback whales (Megaptera novaeangliae). Journal of Cetacean Research and Management 17, 57-63 (2017). ohnston, D. W. in Whale-watching: sustainable tourism and ecological management (eds J Higham, L Bejder, R Williams) (eds J. E. S. Higham, L. Beijder, & R. Williams) Ch. 19, 275-292 (Cambridge University Press, 2014). Tyne, J. A., Johnston, D. W., Christiansen, F. & Bejder, L. Temporally and spatially partitioned behaviours of spinner dolphins: implications for resilience to human disturbance. Royal Society Open Science 4, doi:10.1098/rsos.160626 (2017). Tyne, J. A., Johnston, D. W., Rankin, R., Loneragan, N. R. & Bejder, L. The importance of spinner dolphin (Stenella longirostris) resting habitat: implications for management. Journal of Applied Ecology (2015). Hoyt, E. A blueprint for dolphin and whale watching development. Humane Society International, 32 (2007). Hoyt, E. Marine Protected Areas for whales, dolphins and porpoises: A world handbook for cetacean habitat conservation. (Earthscan, 2005). Hoyt, E. Marine Protected Areas for Whales, Dolphins and Porpoises: A world handbook for cetacean habitat conservation and planning. Vol. Second edition (Earthscan, 2011).